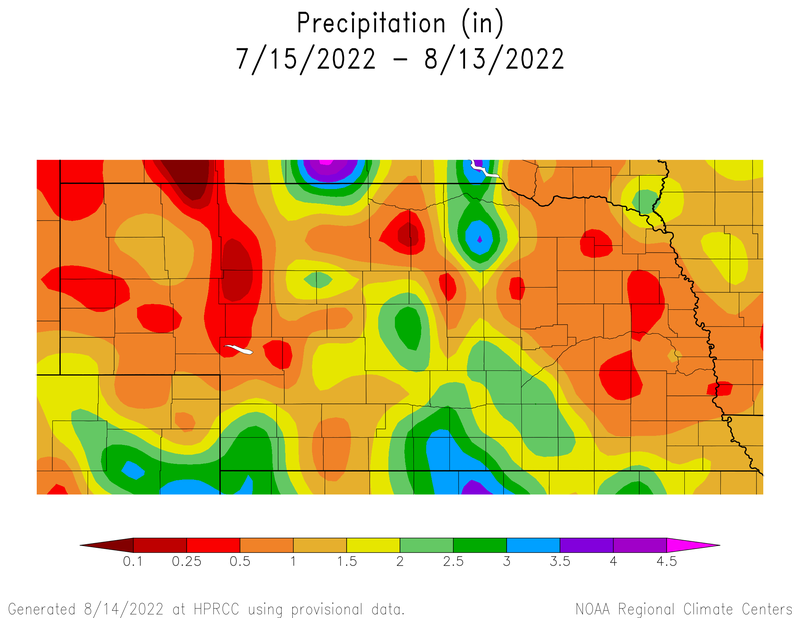 All indications point to a wet pattern ahead for Nebraska and much of the crop growing region. 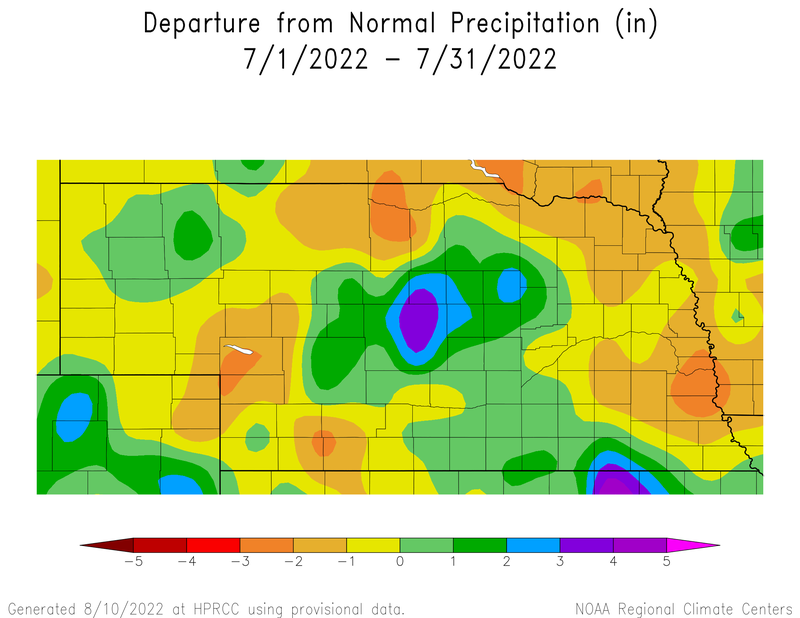 The short-term forecast and extended forecast suggest that we could see above normal moisture to start planting season. After a warm and fairly dry February and early March, the end of the month and start to April may be the opposite. For many locations, some early season moisture would be welcome to add moisture to the top soil and to kick-start pasture growth. This may hinder field activities and planting date; however, what happens the last half of April will determine a lot. This past month finally featured near normal precipitation amounts for the state. Although it was light, and some of it fell on frozen soil, it had been a few months since we last saw near normal precipitation for the region. Most of the state was within 0.5” of normal, but “normal” is only about 0.5” in the west and 1-1.5” in the east. The highest values were near 2” around Omaha to less than 0.1” in the southwest. 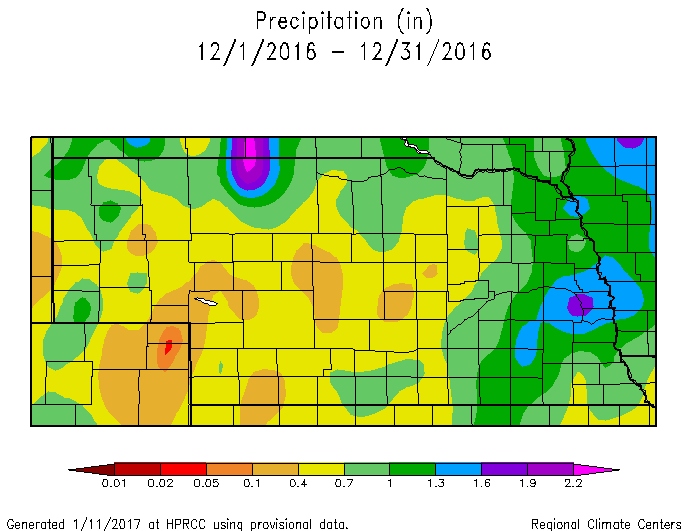 Winter precipitation only accounts for a small percentage of our annual precipitation; however, it can be important when it comes to winter wheat and spring soil moisture. We also finished the month 2°F (east) to 8°F (west) below normal for average temperature, but that probably doesn’t belong in the “Good” section. The bad this month, believe it or not, is severe weather. Tornadoes touched down in Nebraska on Christmas Day near Funk, Gibbon, and Minden and did damage to buildings, power poles, and pivots. These are the ‘latest calendar year’ tornadoes in Nebraska since at least 1950 (records available) and are the first December tornadoes since 1975. The storms also produced damaging winds that were more widespread. You may also remember on November 27th, there were tornadoes near Upland, Red Cloud and Lawrence and were the second ‘latest calendar day’ tornadoes on record. They are now the third latest, thanks to our Christmas Day tornadoes. Apparently, we now need weather radios alongside snow blowers in the winter weather section at the hardware stores. Our string of winter-like temperatures is expected to continue through the week with a warm up into the 20s by the weekend and possibly upper 30s by Sunday (heat wave!). A band of snow moved through Nebraska recently and that may keep temperatures in those areas cooler than surrounding areas. The models are showing a little relief the middle of next week before another push of cold air comes in from the north. It appears northeast and southwest Nebraska could see much different conditions next week due to the location of next week’s front. It looks like the jet stream will separate the moderate and very cold temperatures and will position itself over Nebraska. That is not uncommon in Nebraska, but is a typical late-winter feature. Precipitation this time of year is very challenging, but it does appear a number of disturbances will be moving across the central plains over the next week or two. The middle of next week will be worth watching as temperatures warm and moisture comes in from the south ahead of the next cold front. A tenth of an inch of liquid-equivalent precipitation can ruin your day, so it doesn’t take much to make the ground white. The forecast for the rest of the month is expected to be near normal, but it will feel like a roller coaster for temperature. These cold blasts will be followed by a sharp warm up and this all averages out to be near normal, even thought it won’t feel like it. (The easy part of long-term forecasting!) Historically, the coldest week of the year is next week, so after that, we should be on a warming trend! La Niña: Our weather continues to mimic a “typical” La Niña with abnormally cold in the north and warm in the south. Ocean temperatures are still showing La Niña conditions and the models have this diminishing in a couple months. HOWEVER, there is a cold pool of water in the northern pacific that may throw a wrinkle into this. 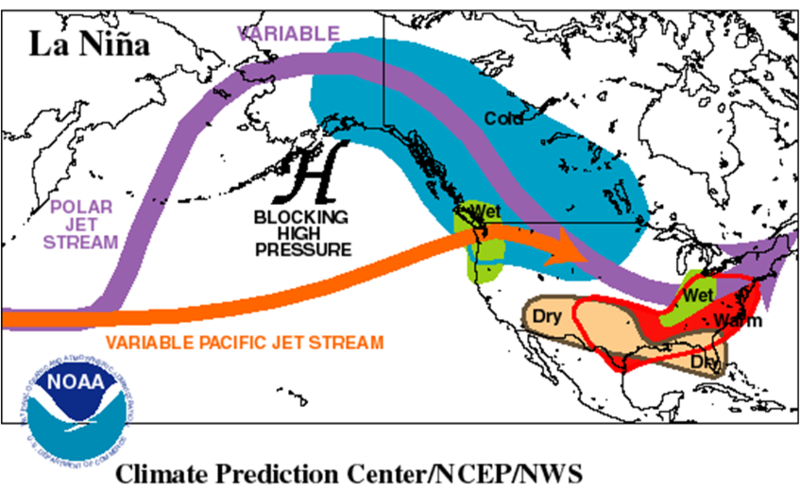 We can see this already with the precipitation in California, which is typically much further north over the Pacific Northwest. Will this cold water slow down the expected diminishing of La Niña? A La Niña spring is dry and cool with dry and warm summer; however, the confidence is weak. On Christmas Day, an abnormal storm system moved through the middle of the U.S. and brought severe weather, heavy rain, and tornadoes to central and eastern Nebraska. In addition to the highly publicized wind and tornado damage, some portions of Nebraska received some beneficial precipiation. Areas from York to Lincoln and up towards Sioux City recieved a half inch or more of liquid precipiation. The SCAN (NRCS monitoring site) station 10 miles east of Lincoln shows a sharp increase in soil moisture percent at the 2 and 4 inch depth (below). Thanks to a week of warm temperatures, the soil temperatures (below) were able to come up above freezing and allow some of the moisture to infiltrate into the soil. The top soil was fairly dry before the rainfall due to a couple months of below normal precipiation and much above normal temperatures. Believe it or not, but this moisture will be beneficial come this spring. For the third month in a row, abnormally warm temperatures have been the story. The 30-year normal maximum temperature for November ranges from the low 50s in the south to the upper 40s in the north and we surpassed that quite often. The state had 12-20 days in November where the high was above 60°F and some spots had 5-6 days with temperatures greater than 75°F. Monthly lows were 5-8°F (west) to 21-23°F (east). Highs were 82-84°F (central and south) to 72-74°F (northeast and west). Soil temperatures at 4” are in the upper 30s in the east and low 30s in the west. At least we have unfrozen soils and any precip will soak in. Not a lot in agriculture is dependent on the November weather, so not a lot can go wrong; however, the warm temps have continued to dry out the soil (with minimal precip), increase pest pressure in wheat, delay anhydrous application, and encourage more tillage. Soil moisture continued to decrease for most of the state, especially in the west, and some areas of moderate drought remained. Stripe rust, grasshoppers, and other pests have damaged a decent winter wheat crop due to extended freeze-free period. Soil temperatures recently (last couple weeks) dropped below 50°F for the state in order for anhydrous ammonia applications to be relatively successful. There also was an abundance of field work due to the quick harvest and nice weather. There are many, many benefits to leaving residue and utilizing no-till practices, but this may not seem like a “bad” thing to some. The recent forecasts have only been accurate out to a few days, so this forecast may be about the same, but we do know that our honeymoon of warm temperatures is over for a while. Arctic air has finally made its push down into the northern plains and we will barely get above freezing through the weekend. This big push of cool air diminished our chances for “snow-maggedon” because the high pressure pushed the system south of our region and brought in much drier air. Overall, the next 5-7 days appears to be cool, mostly dry with a relatively uneventful pattern. Looking past this weekend, the models are not showing any time of pattern-changing system to move through. Temperatures will be moderate to start next week, but may bottom out again the middle of next week. The models are picking up on another push of arctic air down into the center of the U.S. and we could see very cold temperatures. The 6-10 and 8-14 Day Outlooks from the CPC continue to forecast increased high chances fore below normal temperatures for the northern part of the U.S. The latter part of the forecast period (next weekend and beyond) does show a hint of a potential warming trend; however, the models have been hinting at this for a while and it keeps getting pushed back and I will believe that when I see it. The precipitation is forecasted to be near to above normal for our region with the heaviest moisture in the west and east, but it doesn’t take much moisture to be “normal”. The extended outlook for the rest of the month and winter, in short, looks cold. La Niña typically brings in colder than normal temps during the winter for the northern plains. Lately, our weather has mimicked La Niña patterns, so we could see this continue IF La Niña does not dissipate. Be looking for big temperature swings the next couple months with below normal precipitation. Winter is here. For most people in Nebraska, the weather the past few weeks has been fantastic. Average temperatures over the last 30 days have been 6-8°F above normal for almost the entire state. The average highs in October ranged from the mid 70s in the southwest to the mid 60s in the northeast. Average lows were mid 40s in the southeast and mid 30s in the panhandle. The first week of November has been much of the same many of us haven’t seen freezing temperatures for quite some time. Warm temperatures in the fall are often accompanied by dry conditions and that is exactly what we got. Last month, “The Bad” was also a lack of precipitation, and we added about 30 days of dryness to that. Almost all of the state received less than 0.50” over that past 30 days, which is 0.5-2.0” below normal. The dry and warm weather continued to dry out the soil, even with decreasing daylight hours. This has limited potential wheat and cover crop growth and ended the pasture grazing season a little early. The short-term forecast is shaping up to be quite pleasant for the second week of November. A disturbance is moving through the state to start the week, but it is a warm-system moving from the southwest. This will keep temperatures above normal and bring in slight chances for light precipitation. The strong ridge that has been keeping the cold air to the north will stay in place for quite some time. The rest of the week looks to be warm with highs in the 60s and lows in the upper 20s and lower 30s. This ridge will also limit the chance for precipitation as well. With current soil temperatures in the 50s across the state, this warm forecast will keep soil temps above the 50°F mark for many locations in Nebraska for a while. The week two forecast is currently a continuation of the same warm and dry weather. Right now, it looks like this ridge will continue to keep the cool and wet conditions away from the middle part of the country through the beginning of next week. We all know the bottom will fall out eventually, and we will be back to November-like (or worse) weather, but the models are just not picking up on when that will happen. The November outlookshows warm and mostly dry for the U.S., but is probably heavily favored by the conditions of the first two weeks of the month. I suspect the last half of November may be quite different. Looking towards the winter months, our forecast has changed slightly since the last Update. The infamous La Niña is back in the equation and this increases the chances for have near-normal to below normal temperatures during the winter season. We will enter the winter with warm conditions, but the typical La Niña pattern utilizes a strong polar jet to bring in cool/moist air from the northwest. The best chances for this are in the northern states; however, we are very close to those northern states. It is recommended for producers to delay anhydrous ammonia applications until soil temperatures drop below 50 degrees F, since the conversion of ammonium to nitrate slows considerably below 50 degrees; however, it is wise to wait until soil temps have remained under 50 degrees for a week or so. Nitrification inhibitors may be used to apply the fertilizer on warmer soils, but be sure to follow product recommendations and restrictions. 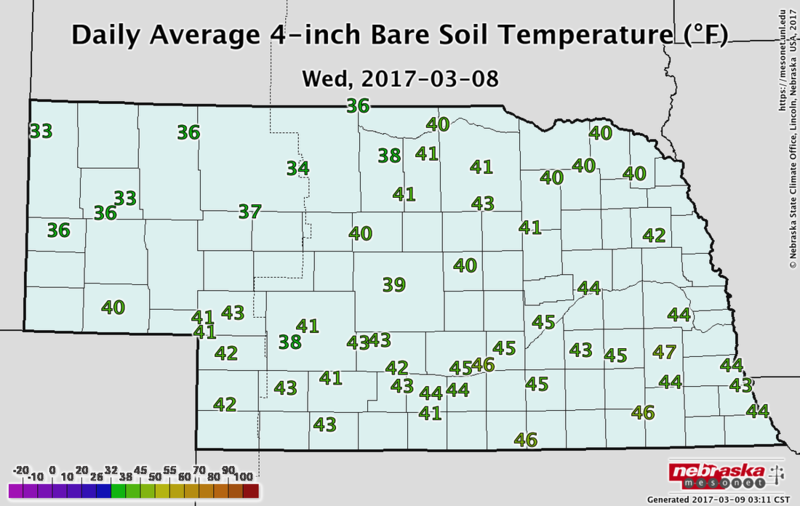 Currently, soil temperatures at a 4" depth under bare soil are in the low 50s in western NE to the upper 50s and low 60s in the southeast. Soil temperatures, especially under bare soil can fluctuate quite a bit from day to day AND from morning to afternoon. 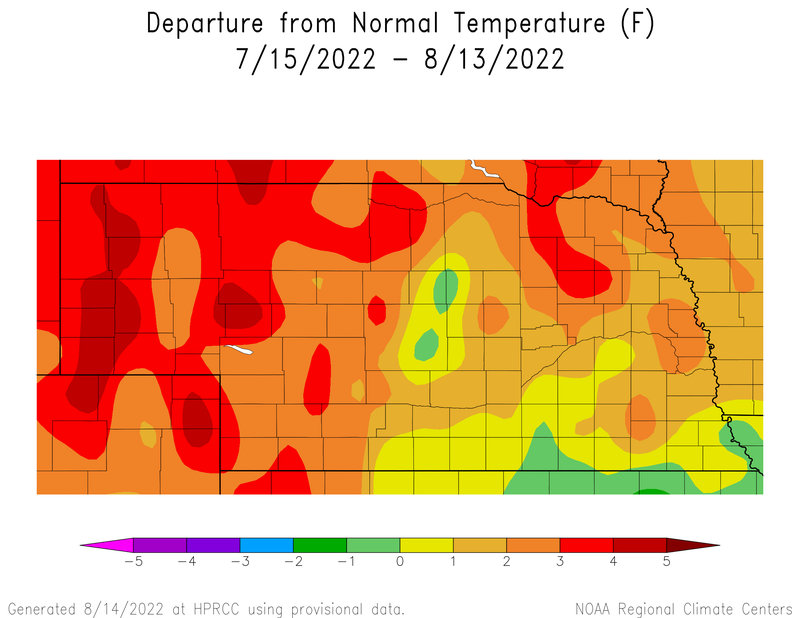 Current soil temperatures can be found at the Nebraska Mesonet (mesonet.unl.edu), which is part of the Nebraska State Climate Office or can be found at CropWatch (cropwatch.unl.edu). These soil temperatures are the average of the entire day, so take that into account, if you are taking your own soil temperatures at a single point during the day. There can be quite a difference between the two. With harvest quickly winding down, you may want to get moving on anhydrous applications, but the forecast for the next 10-14 days does not look like soil temperatures will drop very fast. The Climate Prediction Center 8-14 day outlook has a 70% probability for Nebraska having above normal temperatures for that time period. The normal daily high to start November is in the upper 50s. *Anhydrous ammonia applications in the fall are not recommended for coarse textured soils due to leaching potential or areas with other application restrictions. 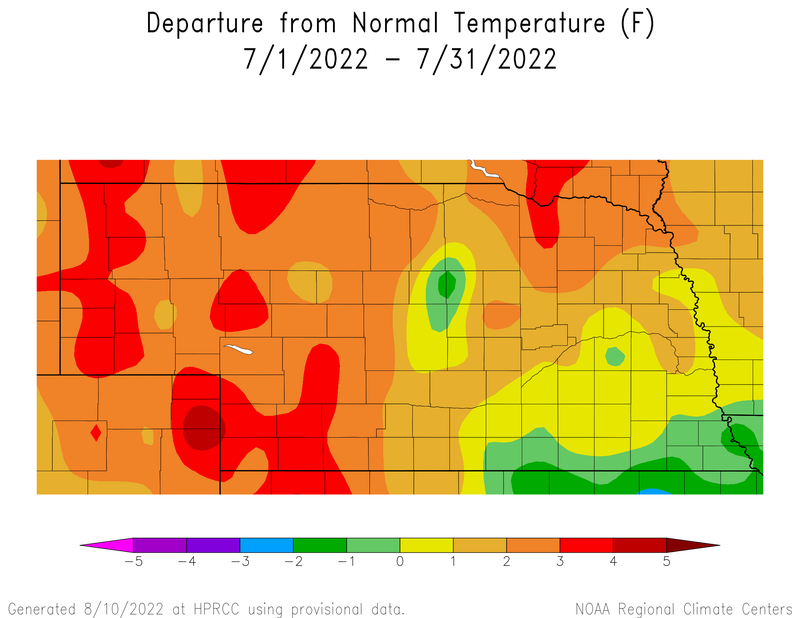 The temperature pattern over the last 30-60 days has been quite favorable for Nebraska. We had some days that reached the upper 90s, but, overall, the temperature pattern has been near to slightly above normal for most of the state. September started with cool temperatures, but the last week or two has yielded some of the best weather Nebraska has to offer. 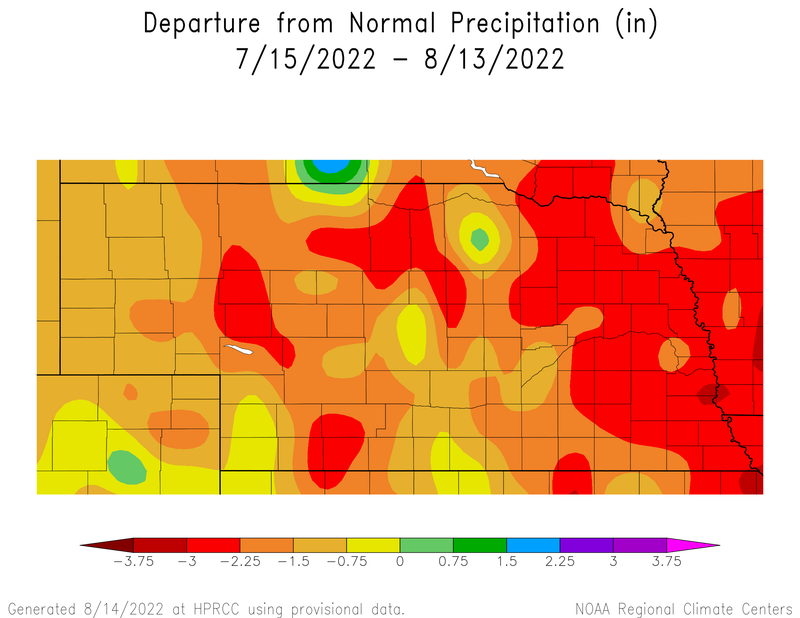 After a rather wet growing season for Nebraska (except for a few locations), we have recently turned dry. Even though many of the crops are mature, late-planted and long-season crops were still using moisture over the last few weeks. Over the last 30 days, portions of central and northwest Nebraska were the driest with less than a half of an inch of precipitation, with a few bands of higher amounts. In general, the state dried out significantly west of Grand Island. This may shorten the grazing season on some pastures and may have aided in early senescence in dryland fields. Temperatures will gradually cool down the rest of this week and have multiple chances for precipitation. The coldest day will be Thursday and best chance for frost is Friday and Saturday morning. It looks like a VERY good chance of sub 32°F temps for the western half of the state with mid 20s in the far west. The big weather system will slide east through the weekend and we will begin to warm up and dry out. The weather will remain relatively quiet and uneventful most of next week, so should have another long streak of good harvest weather. Temperatures will be warm during the day and cool off during the night, so get used to running your heater and A/C in the same day. Looking further out, we may settle into a pattern of these deep systems moving through every one to two weeks or so, and each one will bring in cooler temperatures than the previous. The Climate Prediction Center (CPC) is forecasting generally above normal temperatures for Nebraska for October 10-18, as well as their October outlook that gives us slightly higher odds for above normal temperatures. Precipitation is a little less confident and will most likely be near to below normal for the rest of the month, depending on the speed of some of the upcoming frontal passages. There seems to be some confidence that we will not see a big wash-out over the next couple weeks. La Niña is becoming less of a factor, thus it is not discussed and the winter forecast is a coin toss for Nebraska.